She's got an appetite for justice... and the brains to go with it. How many people can say that satisfying their munches helps solve murders? Meet Olivia "Liv" Moore, a medical resident on the fast track to a perfect life... until she's turned into a zombie. Now stuck between half-alive and undead, Liv withdraws from her best friend, calls off her engagement and transfers to Seattle's morgue to access the only thing that allows her to m.. 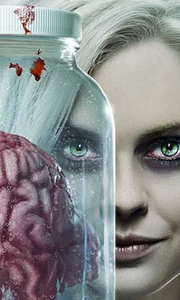 Season Two's adventures into the zombie underworld deliver shocking plot twists, fresh corpses and a cheeky new culinary style for Seattle's favourite crime-fighting zombie sleuth, Liv Moore. She and her ex-fiance, Major, rekindle old love - but when a zombie-hunter finds a zombie in his arms, how long can romance stay alive? Liv's quirky genius boss, Ravi, struggles desperately to recreate the zombie cure. Clive's investigation into th..